I have thoroughly enjoyed using the Brushed Workshop on the Go Kit (G1087) and only had a few odds and ends left over but I had one more layout I wanted to create for my overlays workshop. I’m happy with the way it turned out. The overlay is cut using the Artbooking Cartridge on the Cricut. I set mine at 5″ which made each vertical band 1 1/4″ wide. I was able to scrounge enough pieces at that width to create a pattern behind the overlay. The November Stamp of the month retires on Sunday night – have you got one yet? It is such a versatile set to have and it’s just $5 with a $75 order. Mike and I travelled to England in July to attend the wedding of 2 special friends. We had such fun! One of the most amusing parts of the reception was the photo booth. 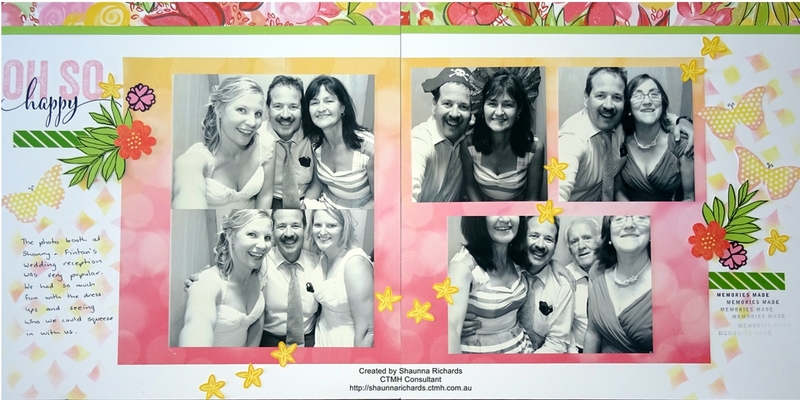 The beautiful bride, Shonny, sent us some prints taken in the photo booth which I love. I thought this layout was the perfect home for these photos. This layout is copied straight from the Brushed Workshop on the Go instruction sheet. It came together quickly. 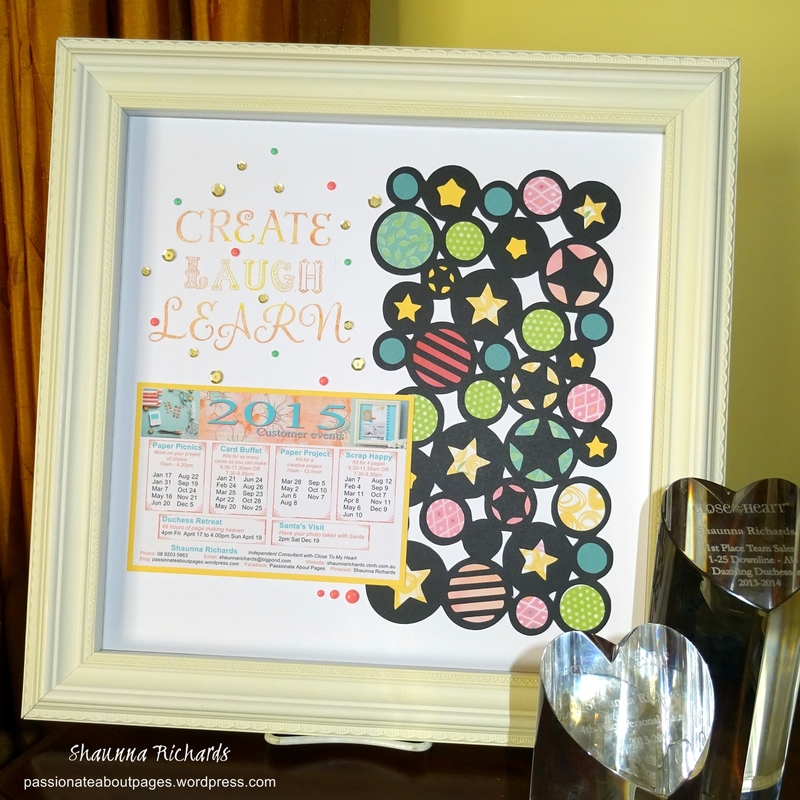 A Cricut overlay was used as a template for sponging – isn’t that clever? I’ll have the overlays pre-cut for everyone attending this Wednesday’s workshop. 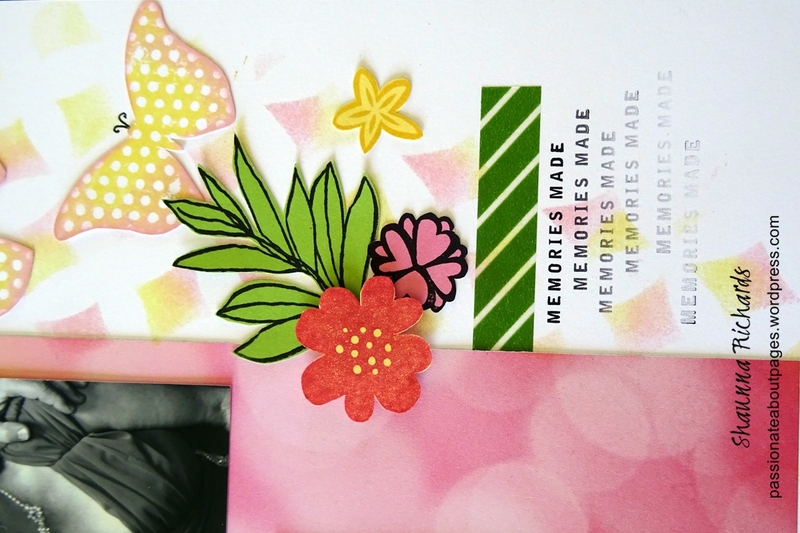 I used the stamp set that comes in the WOTG Kit plus this month’s Stamp of the Month, It’s the Little Things to create the embellishment cluster. 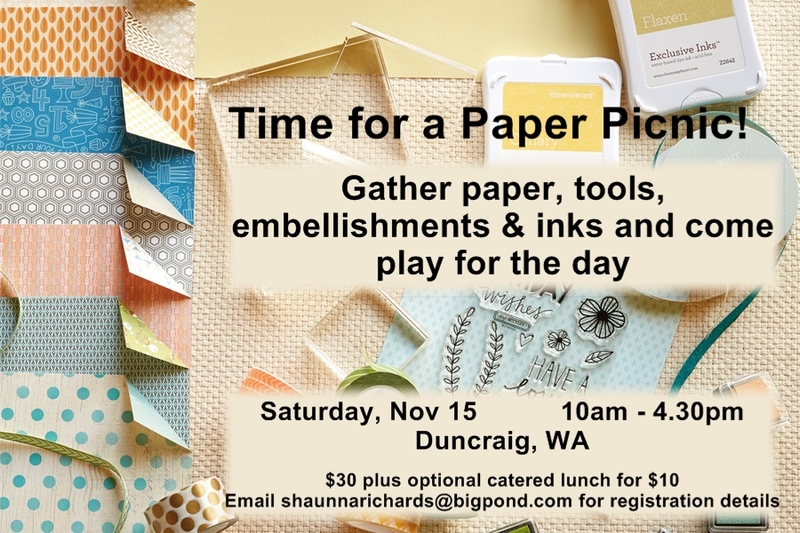 I stamped onto cardstock and then fussy cut with my scissors. A bit of Topiary Washi Tape (Z2002) added a focal point. Order your Brushed Workshop on the Go Kit (G1087) by clicking here. I love my Cricut machine! 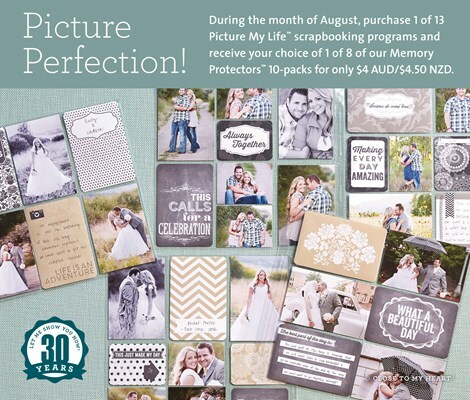 I’m not sure how I scrapbooked without it. Today’s layout features an overlay cut from the Artbooking cartridge. You’ll find it on page 64 of the Artbooking booklet. I had a lot of fun filling the holes with papers from the Brushed paper Pack. The stamped title uses 3 different stamp fonts and 3 ink colours. Ink entire title in lightest colour then daub the medium and darkest colour around edges. 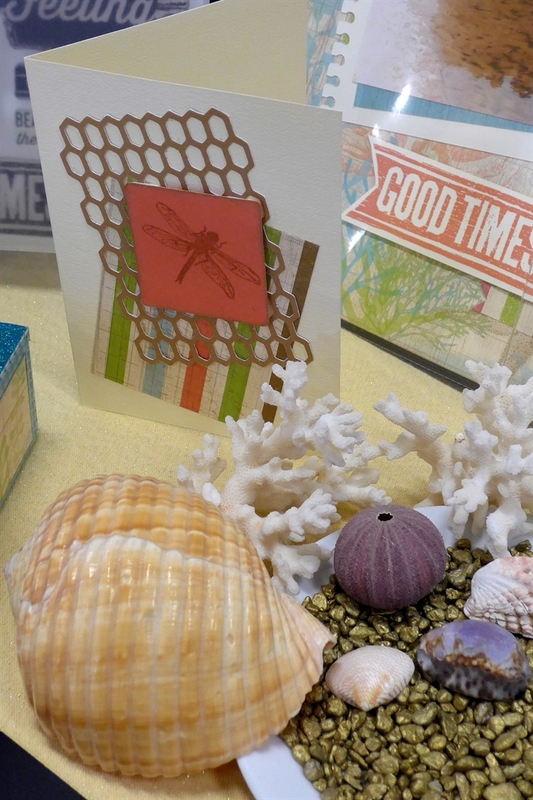 This layout is displayed in CTMH’s Designed Décor Shadow Box in my workshop room. The Shadow boxes come in Black (Z2015) and Colonial White (Z2016). I love the fact the frame is on a hinge so I just lift it up to swap out my display page and a 12″x12″ page fits perfectly inside. They make great Christmas gifts! 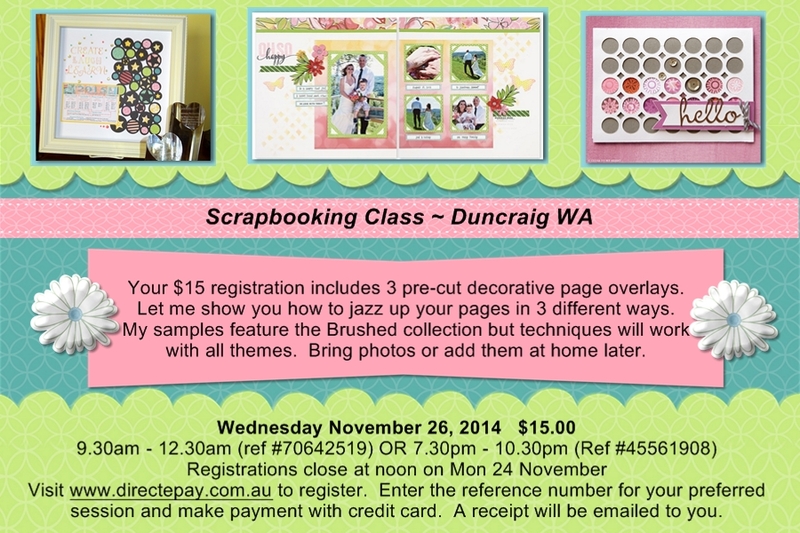 This is one of 3 techniques I’m teaching at next Wednesday’s scrapbooking workshops. I’d love to share my tips to make the job quick and easy. Why don’t you join me? 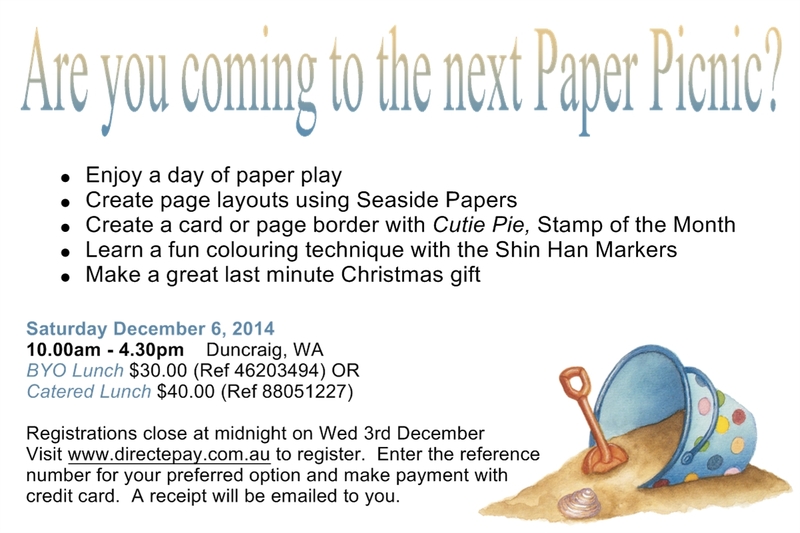 Click here to register using the reference number for your chosen session. When I was at the CTMH Convention in Disneyland, I spent some time in the theme park (as you do) and one of my favourite activities was watching the parade in the afternoon. The first day I watched the characters and was caught up in the magic of it all. The second day I was standing behind a little girl, all dressed up like a Princess, who was having the time of her life. I think I spent more time watching her priceless reactions than I did the show. 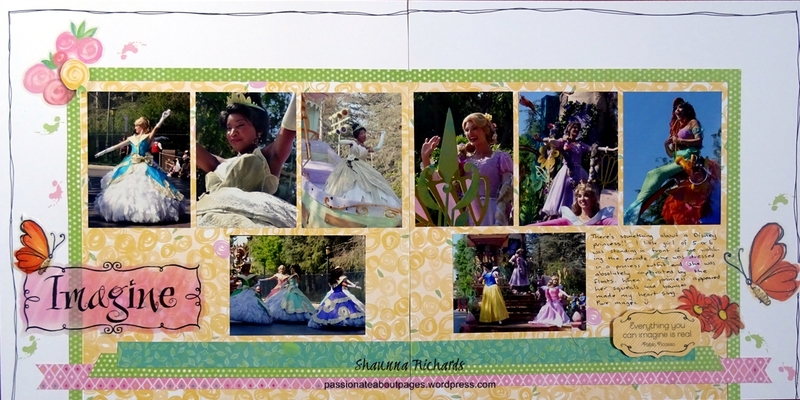 This layout is featured in the Brushed WOTG Kit and it is perfect for my photos of the Disney Princesses in the parade. 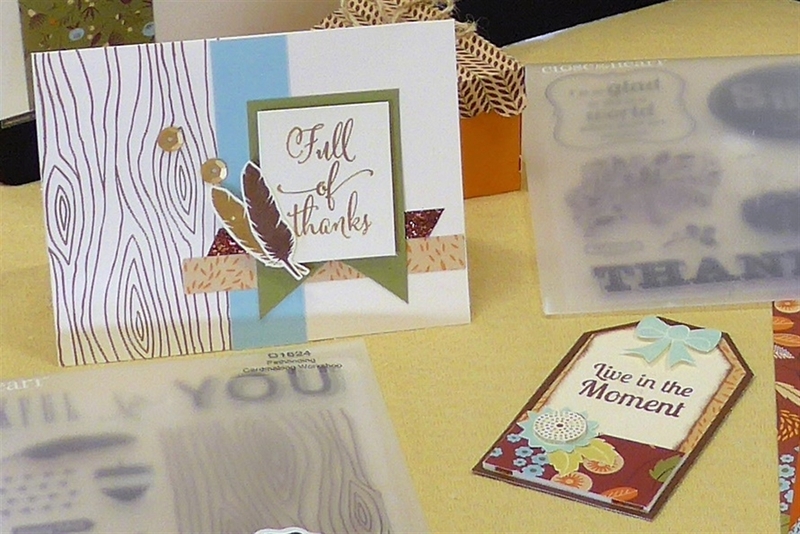 The Brushed complements stickers are vellum so you get to see a little of the papers through them – gorgeous! The page came together really quickly. I have a little trick I can show you in class for cutting the green frame around the yellow paper – it’s quick and saves paper. Ask me to show you how next time I see you. Click here to order your Brushed papers and complements or drop me an email. 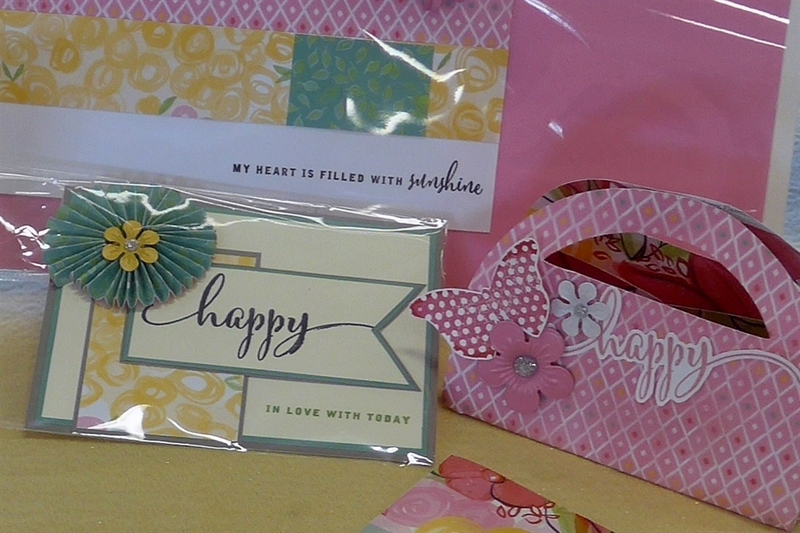 I’m featuring this pack in all my classes throughout November – it fits so well with all the beautiful blooms in the gardens here in Perth at the moment. 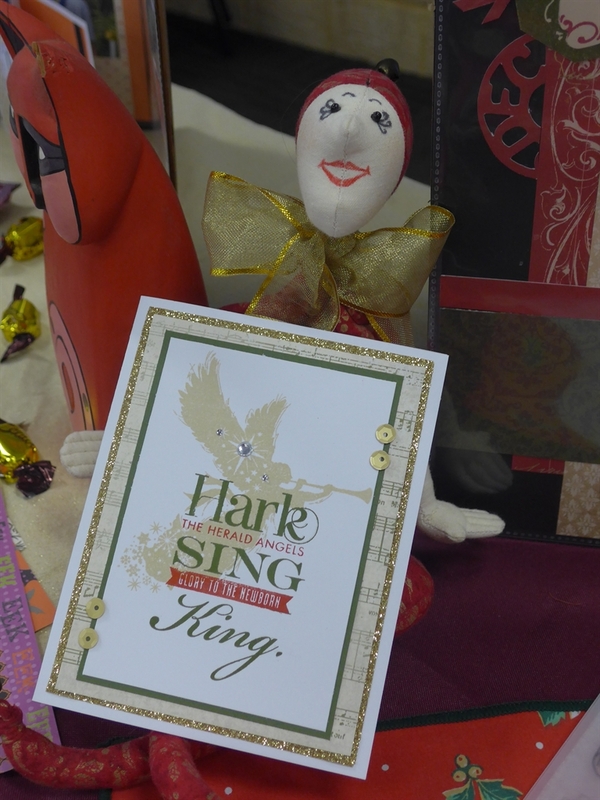 Today’s post features some beautiful cards made by my team members and colleagues for last weekends product launch. They are sure to get your creative juices flowing. I’m on a mission to encourage more people to create and mail handmade cards ‘Just Because’ they can. We only receive dreary bills and statements in our letterboxes these days. Let’s brighten someone else’s day by writing a card and posting. I’d love to hear how your friends and family react when they receive them. 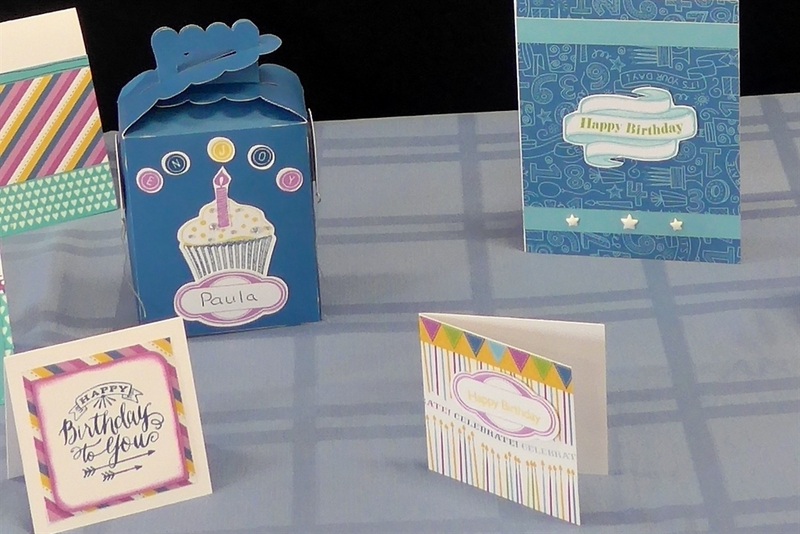 Aren’t these Confetti Wishes cards and treat box delightful? Paula Willemsen in my team made them. 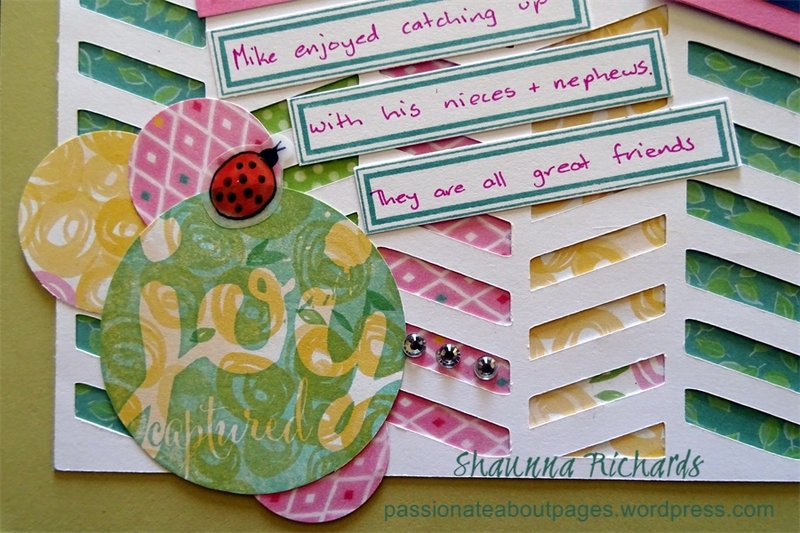 Rose kendell, a CTMH colleague created this card from page 7 the NEW Ideas Book. This stamp is available exclusively to our Hostesses. Book a party today!